My family and I were just talking about how much we enjoy our pets, and I thought it would be fun to investigate some science-related activities you can do with pet animals. This week let’s start with mice. Be sure to leave a comment and tell me what pets you’d like to see next week. I'd like to hear about your favorite pet. Have you ever had a mouse, gerbil or rat for a pet? They are lively and interested in everything that is going on. Here are some science activities to help you explore mice. Many of them do not even require that you actually own any mice. Learning to identify or classify animals is an important scientific skill. What kind of animals are mice? They are a type of mammal known as rodents. If you are unfamiliar with this term, you might want to visit to the “What is a Rodent?” Activity Page to learn more. While you are at it, think about how to identify rats, hamsters, gerbils and mice. What are the similarities, and what are the differences between them? If you are interested in getting a pet rodent, you might want to research what each type needs in the way of housing and care, and make a list of the advantages and disadvantages of ownership. For example, hamsters are likely to sleep all day, whereas mice are have active periods during the day making it easier to interact with them. Mice produce more urine and feces, however, so need to be cleaned more often than gerbils. Decide what factors are more important to you. Did you know there are many types of wild mice? You might want to find out about some really wild mice like jumping mice, cactus mice and grasshopper mice. 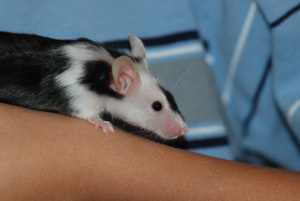 Spiny mice are an interesting species kept in zoos and used for research. Gerbils and kangaroo rats have special characteristics for living in the desert. What do mice eat? Did you say cheese? You hear about mice and cheese everywhere, but in truth it isn't a good idea to feed cheese to mice, it can make them sick. Can you believe it? Now might be a great time to investigate what mice really do eat. One source of information, in addition to books and the Internet, might be the ingredients on the back of commercially available pet food. In a previous post, we introduced the idea of theme gardens. Once you have a good idea what mice eat, you can design a garden to grow some of their favorite foods, for example sunflowers and/or peanuts. If you don’t have mice, the birds and humans will still appreciate the results. If you have some mice and you aren’t sure what they like to eat the best, you can do a food choice experiment. Gather a clean cardboard egg carton. Cut out a section of four egg carton cups. Place the items you want to test in the separate wells. You might want to mark them so that if all the food disappears, you’ll know which was which. Always provide your mice with something you know they like, so they won’t go hungry. Watch to see which food the mice eat first. Come back every hour and record which food is disappearing. To be very accurate, you can weigh each type of food beforehand on a kitchen scale and then at the end of the experiment. If the experiment doesn’t go as expected, think of ways to modify your methods and try again. Another fun project might be design and build a house and/or nest box using wood or cardboard. The San Diego Zoo has a mouse house made out of bread! We saw one when we visited the zoo a few years ago. The idea seemed weird at first, but then we got to thinking it might be fun to live in a house that you can eat. I cheated and used our bread maker to create the loaves. 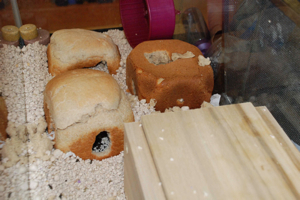 The mice seemed to enjoy being able to modify the structure and eat at the same time. We found our mice always rush to investigate new objects. They also are very active, and love to run and climb. In addition to providing standard running wheels, you can design your own playthings like ladders or tubes to run through. Just make sure the toys are safe, that the mice can’t get tangled or fall. Adding toys and other fun items for the mice to examine helps with behavioral enrichment, so they don’t get bored. Our mice are handled every day, so they are easy to pick up and hold. If you have new mice, you can tame them by gently picking them up and holding them. Once your mice are tame, you can train them to do tricks, such as sit on your shoulder. You can also make a maze, and see how fast the mice learn to go through it. We made a maze of lightweight CD cases, so there was no danger to the mice. When you have mice, you will hear them make many different sounds and also behaviors. Investigate how mice communicate to one another. Recently scientists have found out that male mice sing a song when they meet females, but the sounds are ultrasonic, which means humans can’t hear them. Here is a link to an adorable story about a classroom mouse named Cheeser who gave birth. The website tells the story, complete with pictures of the growing young mice. If you don’t go to any other link, try this one. Finally, be sure to write down your experiences, keep records, and share your stories. Who knows, you might come up with the next exciting scientific finding about mice. There are literally 100's of fiction books with mice as main characters. Now would be a great time to reread some of your favorites or try a new one (images and linked titles are affiliate links to Amazon). Could You be a Mouse? (1990) is a nonfiction book that is a fun game. The reader actually makes choices about what a mouse should do and then flips the pages to find out the results. Caution: There is a drawing of a dead mouse which could be disturbing to young and/or sensitive children. Older children should find it fun and informative.